A bipartisan group of mayors from the U.S. Conference of Mayors was turned away from entering a temporary detention facility in Tornillo, Texas, which is holding undocumented children separated from their parents. On June 20, President Donald Trump signed an executive order to end parts of a highly controversial policy of separating children from their parents who illegally crossed the border, according to the Texas Tribune. Under the policy, 2,342 children had been seperated from their parents at the U.S./Mexico border between May 5 and June 9, according to Texas Monthly. Politicians across party lines as well as people around the world voiced outrage at the policy. While the policy was revoked and over 500 separated children have been reunited with their parents, concrete plans to reunite the rest of the children separated from their parents have not been announced yet, Axios reports. The day after Trump signed the executive order, over a dozen mayors from across the country gathered outside a “tent city” set up to house such children to protest the Trump Administration’s immigration policy, the Tribune reports. The group also wanted to learn how the executive order might affect the children housed there. 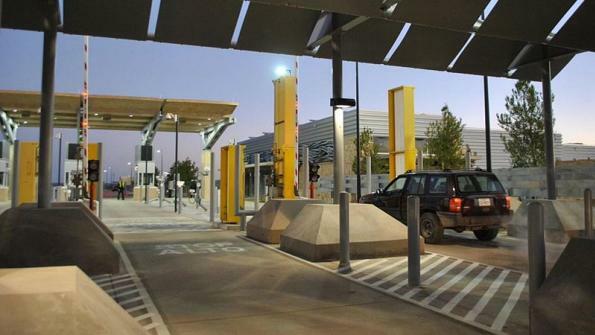 However, U.S. Department of Homeland Security (DHS) officials turned the mayors away from entering the facility, according to the Austin American-Statesman. Officials told the mayors that they would have to fill out multiple forms to potentially gain access in the next few weeks. “That’s hard for us [to understand] because we don’t see a collection of elected mayors from across the country as posing any kind of security or administrative risk,” Austin, Texas, Mayor Steve Adler said, per the Tribune. Mayors in the group included Adler, Bill de Blasio of New York, Jenny Durkan of Seattle, Eric Garcetti of Los Angeles, Dee Margo of El Paso, Texas, Tim Keller of Albuquerque, N.M., Alan Webber of Santa Fe, N.M., Tom Tait of Anaheim, Calif. and U.S. Conference of Mayors President Steve Benjamin of Columbia, S.C., according to various news outlets. The tent city was built about a day after the Trump Administration confirmed its location to house over 250 undocumented immigrant minors, according to the Tribune. It can be expanded to house over 4,000 people. It was built due to a lack of space at other detention facilities across the country to house children separated from their parents under Trump’s “zero tolerance” policy, the American-Statesman reports. Other information on the facility is limited. “I don’t know where those children came from, I don’t know where their parents are, we don’t know what’s going on,” El Paso Mayor Dee Margo said, per the Tribune. Federal officials approached El Paso County Sheriff Richard Wiles to ask him to provide off-duty deputies to work security at the tent city, Texas Monthly reports. However, Wiles has prohibited his deputies from doing so, saying department doesn’t support the separation of children to discourage illegal immigration. “I just thought that if the citizens saw that we were working there in an off-duty capacity, it may be [seen] as if we were approving of the administration’s policy, and it would hurt our relationship with the community that we serve,” Wiles told Texas Monthly. Tornillo is a census-designated place that does not have a government or a police department, according to Reuters. Still, not many in the town of 1,600 support the policy. “I wish that Tornillo as a town was not going to be remembered throughout the nation as the place where there are tents for children,” Rosy Vega-Barrio, superintendent of the Tornillo Independent School District, told Reuters.